Worldwide icon-chevron-right Europe icon-chevron-right United Kingdom icon-chevron-right England icon-chevron-right London icon-chevron-right Ripley's Believe It or Not! Before the days of Google, YouTube, Wiki and the like, the only way for people to find out about stuff was by books and word of mouth. Unthinkable, huh? Well, in the early twentieth century Robert Ripley was one of the most experienced mouthpieces out there. He made a name for himself as a cartoonist, creating regular illustrations depicting exotic and unusual cultures from around the world for the New York Globe and later the New York Post. These led to a run of books, a radio slot that lasted 14 years and was broadcast from weird and wonderful places, including underwater, in the air and in a snake pit. Ripley also landed a TV show in 1948, shortly before his fatal heart attack a year later. 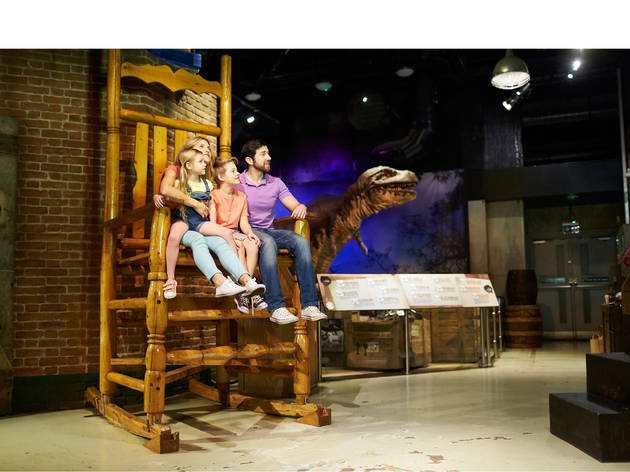 The late, great adventurer’s legacy lives on in Ripley’s Believe it or Not! These museums of oddities – the largest of which is here in the capital and first opened its doors in Piccadilly Circus in 2008 – are still delighting and disgusting viewers today (because who doesn’t want to gawp at a two-headed cow?). As you embark on this self-guided tour through the five-storey building, you’ll encounter seven zones: Amazing Art, Curious Cultures, Remarkable People, Incredible Nature, History Rediscovered, Weird But Wonderful and Amazing Microsculptures by Willard Wigan. Particularly bizarre exhibits include a picture of Michelle Obama made out of bottle tops, Jo Jo the dog-faced man, a gorilla made out of car bumpers, the man who had his body reshaped to look like a lizard, the tallest man on earth (8ft 11in) and so on. There’s also an outpost of the Hard Rock Café here – a fashion collection with garb charting musical icons from Elvis Presley to Lady Gaga. If you get a little restless just looking at objects, see if you can twist and turn through the Impossible LaseRace, trying to avoid the laser beams and getting through the challenge in the fastest time. There’s also mind-boggling, ‘spinning’ Black Hole walk-through, a Mirror Maze and a digital graffiti wall – it’s all brilliantly silly, offbeat fun. Basically, if you could imagine the opposite of the British Museum, this would be it. Here the humdrum is remarkable because it’s just plain weird, not because it’s thousands of years old – right down to the wedding dress made from toilet paper. Besides, just like the British Museum’s Hans Sloane, Ripley was ultimately an obsessive collector and an enthusiast for new discoveries. He just happened to take himself slightly less seriously. IMHO ... If it was free, I am not sure I would recommend it. £26.95 an adult, £19.95 per child. This include the (seemingly compulsory) purchase of a mirror maze @£3 and Lazer race @£2. The maze was mildly entertaining, the Lazer race had a huge queue (as did the lifts when trying to get between floors). A lot of the exhibits were very obviously replicas and some looked a bit knackered. The 'art' work was OK but not that good. My son thought the view out of the windows was better than most of the exhibits, so did I. The cafe, force photo session, sweet shop, gift shop and attached arcade game centre made the experience difficult of parent's contributing to a very expensive, low value day. I think they should have used the space to find more exhibits. In my 15 years in London, this is the worst place I have been to, sorry f that offends anyone, just trying to be honest. This is some A grade tackiness right here. Wander around some of the cheapest illusions you can find, go through a mirror tunnel, crush a penny, take a picture with a model of the world's tallest man! You might leave with a bit of extra, slightly irrelevant knowledge and an overpriced, useless, souvenir but that's not to say it's a waste of time. With the right people, like most of life, Ripleys can be fun. I wouldn't want to go here when it's busy, I wouldn't want to pay full price for tickets and I certainly wouldn't want to go here alone. With friends or young children, it can be a lot of fun but you have to know what you're in for. Tackiness. In abundance. Visiting Ripley's Believe it or Not is a curious affair, as you'd expect. However, this may not fully be for the right reasons. The set up is designed to grab the attention of tourists boasting curiosities from around the world all crammed under one roof. While full of many interesting items many are also replicas, pictures, or items similar to the originals being described, although they have put the time into providing enough background information to offer a bit learning opportunity.For a Central London attraction, it is an impressive size and a tip for Londoners would be to visit our of hours when the tourists have gone home you will find a near empty maze of curiosity which only adds to the experience. Commercial-ness and tackiness aside, this is essentially a museum full of random (and mostly gross) facts and oddities from around the world. Shrunken heads, whale foreskin and a picture made of actual butterflies are just a few of the things that I found unpleasant. There are some really cool things too like a whole room dedicated to sculptures inside the eye of a needle. Inside, the eye of a needle! There are also some really fun things like the mirror maze and the giant rocking chair. It's fun but it's not for the squeamish and it's bright and loud so it can feel like a sensory assault at times and obviously the exit is through the gift shop (insert eye roll here). If you can get tickets cheap or for free and you have an interest in random facts from around the world then it's worth a couple of hours. Not a bad way to spend a few hours on a rainy day, although to be honest it is nothing spectacular. 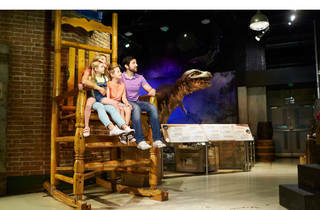 The attractions and exhibits are fun and interesting, and will particularly appeal to school age children. Our daughter particularly enjoyed the mirror maze! A little over-priced for my liking and it seemed to get very busy and over-crowded, I would only visit again if there was a special offer on! Some friends were visiting London and as we were caught out in the rain in the vicinity of Piccadilly circus, we decided to give Ripley's Believe It or Not! a go. It provided shelter and fun for a couple of hours, so it served the purpose + my friends were tourists so they enjoyed it, however I wouldn't recommend it to locals. It's too pricey for what it is (several floors of artifacts and trivia) and is definitely children-oriented. i bought this on a deal so it worked out good value. A great day out learning everything you didn't need to know but might be interested in. The kids loved it as had lots of useless/useful information that kids want to know lol. A great day out in london if the weather isn't good. It's what you expect, a few rooms full of crazy looking things and people. It's in a convenient location right by Picadilly circus. If you are planning on doing this get the package where you can go to more than 1 attraction in London, it will save you some money. This is definitely more for kids. It is exactly what you'd expect to be as tourist attraction in the center of London. It's not awful, but it's definitely not worth the price when there are so many amazing things to do in London. It does not show anything of the city, and there is no point in traveling to see generic exhibitions. If you are a tourist reading this, then please feel free to keep pumping copius amounts of money in to our economy through attractions like this. If you are a Londner - you should know better. My boyfriend and I visited Ripley's on Valentines Day at an after hours event. We got a free box of chocolates and a glass of champagne included in the ticket price which got our night off to a great start. We began by measuring ourselves up against the tallest man in the world, then jumped on some scales to see how our weight compared to the heaviest. We had lots of fun exploring the weird and wonderful exhibitions Ripley's had to offer. Ripley's wasn't all fun and games though, as we came across some pretty thought-provoking items in the museum. One of the most interesting was a tank of water which was as cold as the Atlantic when the Titanic went down. Feeling the icy water made this historic event all the more haunting. We finished up with a game downstairs, where we had to weave and duck over and above some laser beams in a James Bond style mission. We had loads of fun and got pretty competitive against the other couples racing to beat the clock. I would recommend Ripley's to everyone- all the people we bumped in to seemed to be enjoying the museum as much as we were! Look out for great deals on ticket prices or use a Time Out card. Great attraction to spend couple of hours. A lot interesting exhibitions, very educational, if you like to read and explore and broad your horizons- that's the place to be. A lot of photo opportunities, you can take pictures everywhere. Cafe is located in the middle of a huge library, very competitive prices. Welcoming, funny staff, everyone was very friendly. Very good fun and eye opening! London's alternative attraction. Really was unimpressed. Too expensive for what it is. Unhappy staff. Near Ripley's Believe It or Not!